Extra storage is created as part of a headboard feature wall. 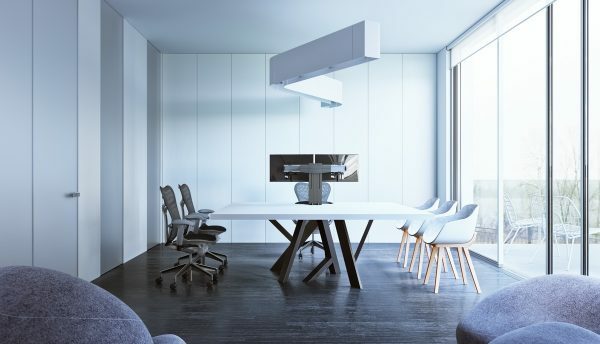 We’ve all seen the futuristic interior design ideas splashed across space and time travel movies, and gradually these aesthetics are becoming a reality. 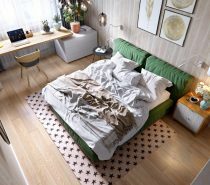 Heads are being turned by new ideas on furniture design, and minimalist hidden storage ideas are adding to the mix to forge the way forward. 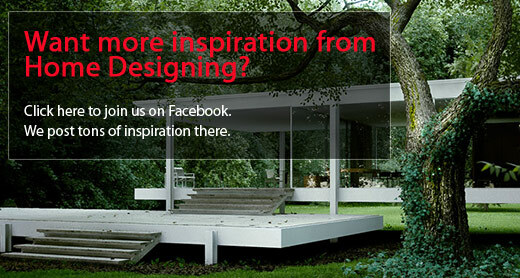 What exactly does home style of the future look like? 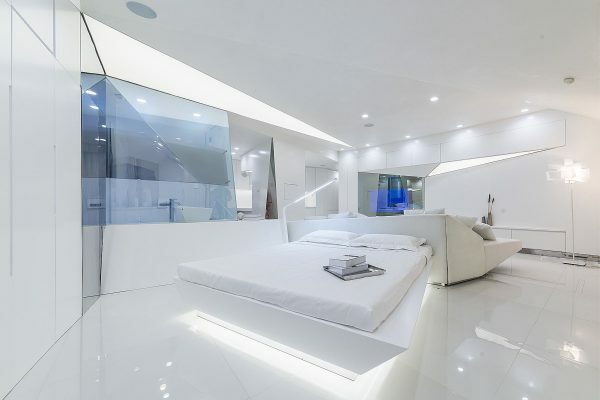 See for yourself with these futuristic interiors that offer us two quite different takes on the theme. 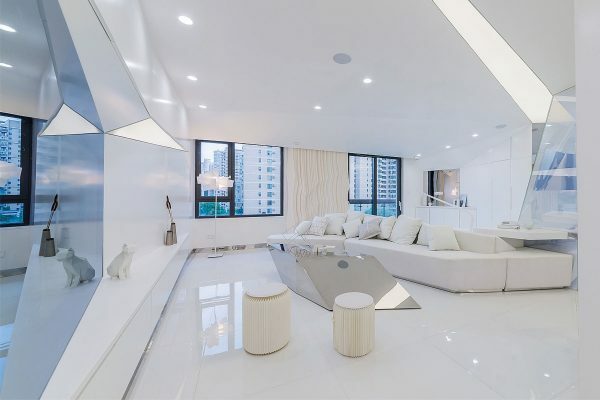 The first encompasses stark white decor in an angular living space. 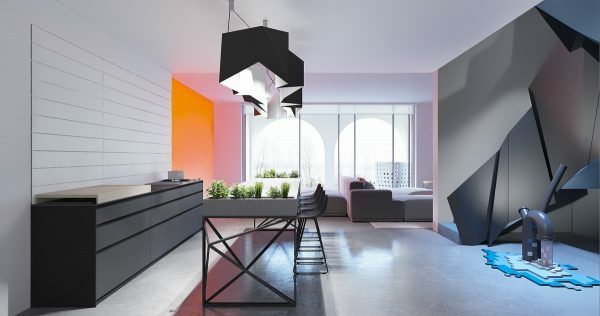 The second is a softer transition into the future, with some familiar furniture silhouettes and colour relief mixed in with geometric influence and fresh thinking. 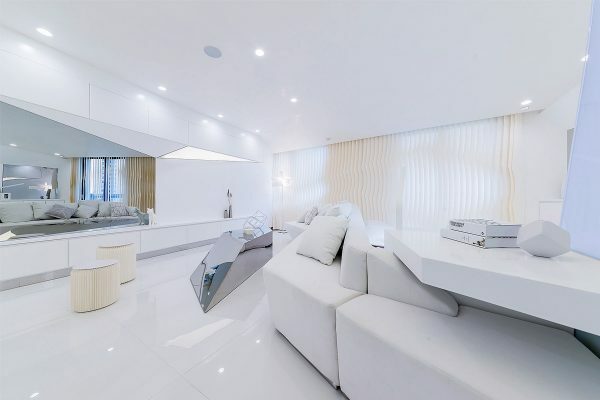 Our first home design project, entitled the ‘Crystal’ Apartment, is a dramatic change from the soft surroundings that we’ve become accustomed to. Triangular cuts and folded edges create a strong visual impact, almost as though the interior was formed by a master of origami. The paper art theme is continued over in the window dressing too, where window blinds have cutaways to create a unique undulating pattern from end to end. The unique coffee table appears like a giant broken shard of mirrored glass. One end of the sofa is raised like a cantilevered deck, echoing the same design feature as the neighbouring coffee table. 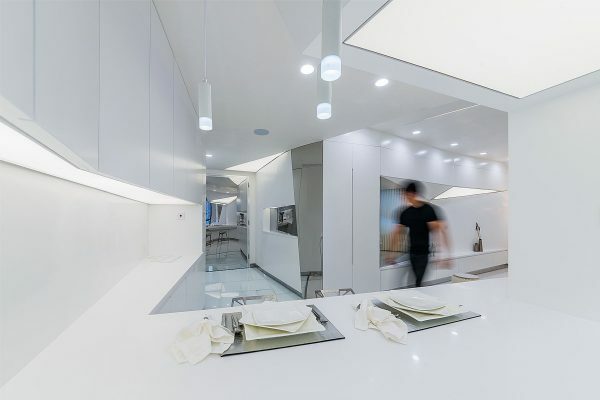 Angled cutaways in the wall and ceiling create plains for extra light sources, which help bathe the arctic white room with brightness and reflection over its ice-smooth floor. Stainless mirrors and dimming glasses have been implemented to increase the look of space. One of the cutaway angles acts as a bench seat opposite the sofa. 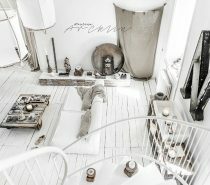 Other occasional seating in the room comes in the form of two small white drum stools, which have a folded paper look around their base. The sofa is shaped almost like a lightning strike, with one end impacting against a wall with an accessible shelf on which to place books and drinks. A control panel is concealed in a wall that marks the transition into the kitchen. 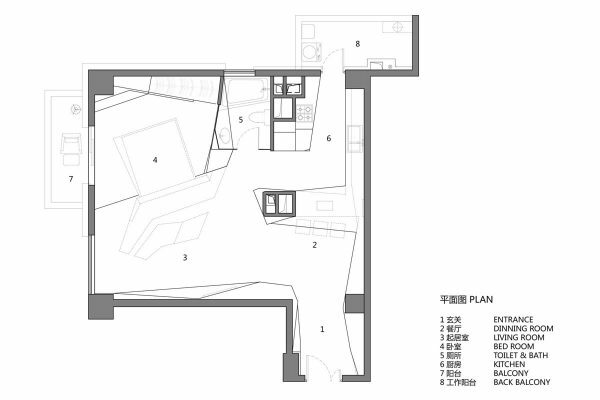 … This is because the bed is located directly behind the sofa, making the entire apartment one single open plan living space. 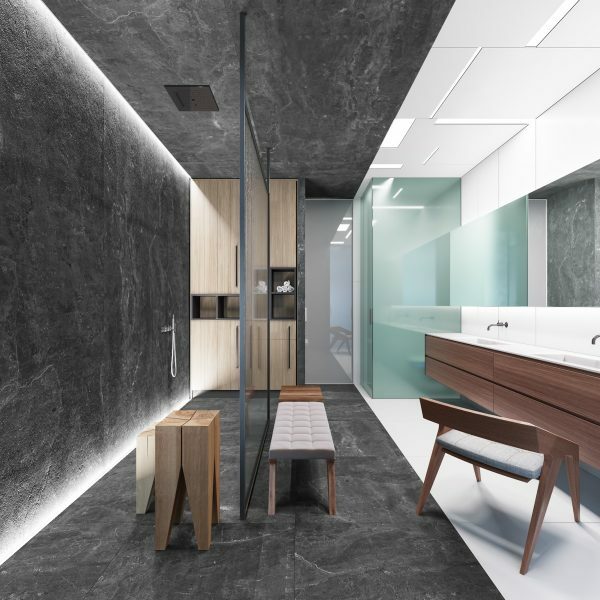 The open flow makes every millimeter count in the limited dimensions of this apartment, allowing the eye to absorb the whole space from corner to corner – even the bathroom can be seen through a glass panel. 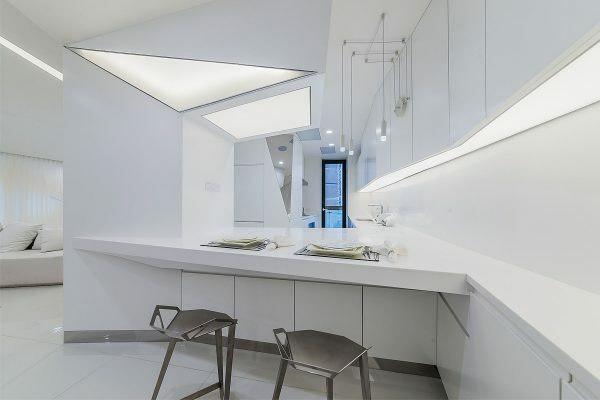 The dining area is an irregular shaped breakfast bar, teamed with angular kitchen counter stools. 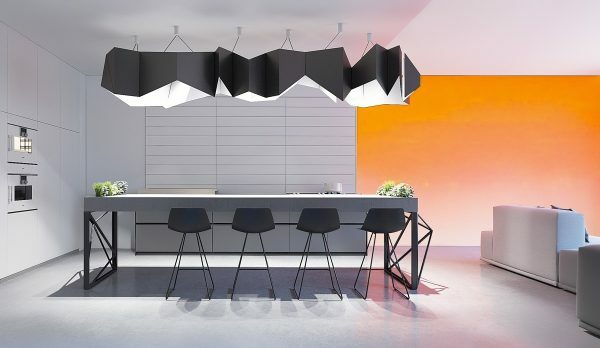 The breakfast bar light is a set of minimalist pendant lights. 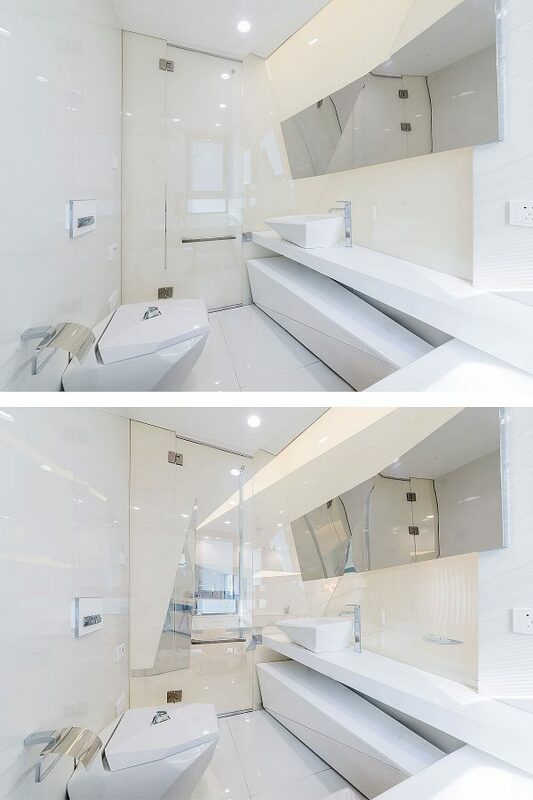 Inside the bathroom, folded edges make the toilet look like a modern art sculpture. An irregular shaped basin sits on the modern bathroom vanity. 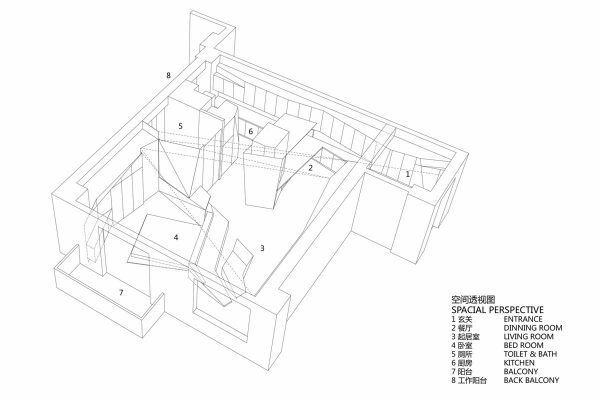 We can see from the home plan that the bathtub also has a bespoke outline. 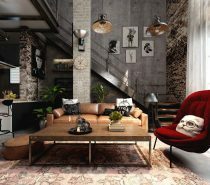 A young couple resides in this Italian Quarter townhouse in Kiev. 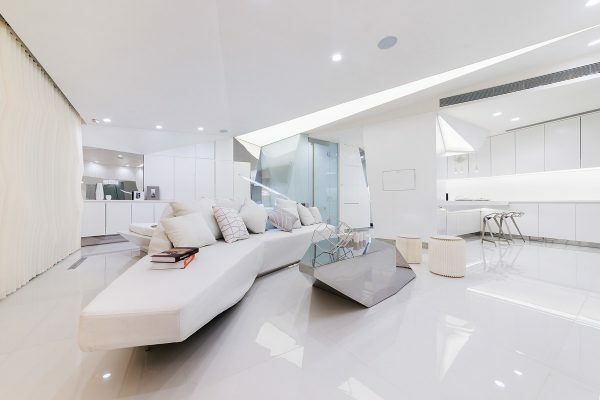 One of the homeowners is the head of an advanced IT company, which inspired the home designers to focus on technical progress and functionality. 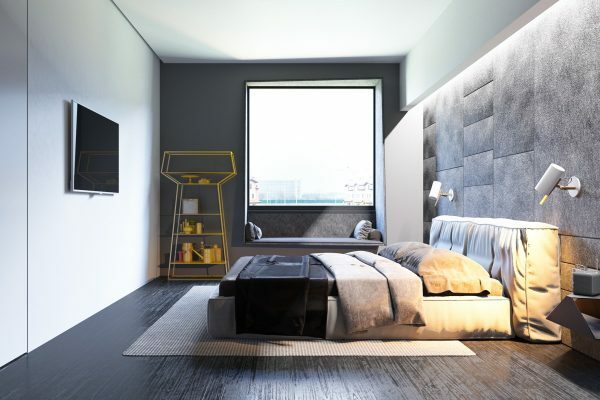 As well as having an ultra modern interior style, the apartment meets all of the requirements of a smart home. All the building elements are connected by one system so the owners can use just one smartphone app to maintain control of the security system, monitor the heating system with a heat pump, regulate central ventilation and air conditioning, and manage lighting and electrical appliances at any time, wherever they might be in the world. 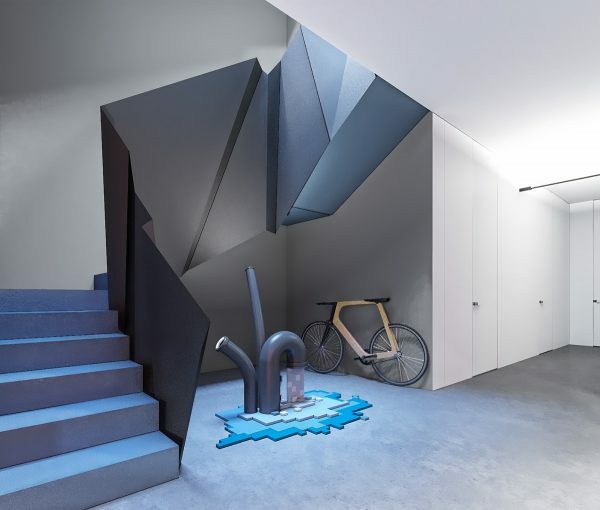 The 250 square metre home is decorated with a base of gallery white and deepest black, with an overlay of bright furniture and colourful illumination. A diode light changes color to suit the mood of the owners and the time of day. Feature walls have been lit from below to emphasise texture and colour. This enormous dining table light has a crunched effect to its shade for an angular look. The staircase balustrade continues the free-formed angular look. This two-storey townhouse has one open plan social space on the ground floor, with a private zone upstairs. The home has twelve rooms and a terrace on each level. At the bottom of the staircase a pixelated work of art plays on the theme of computer technology, the inspiration for this home interior. A large table has three dining chairs to one side, and three desk chairs surrounding another two sides. Flat fronted, handle-free cupboard doors subtly conceal their secret contents. 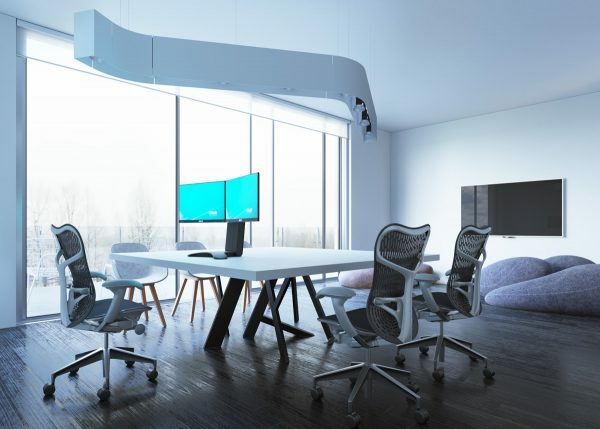 One ergonomic desk chair faces a stand holding dual computer screens. An undulating ceiling pendant lights the whole area. In the master bedroom there is a soft feature wall that supports a modern wall sconce at each side of the bed; these are the Scantling Wall Light. 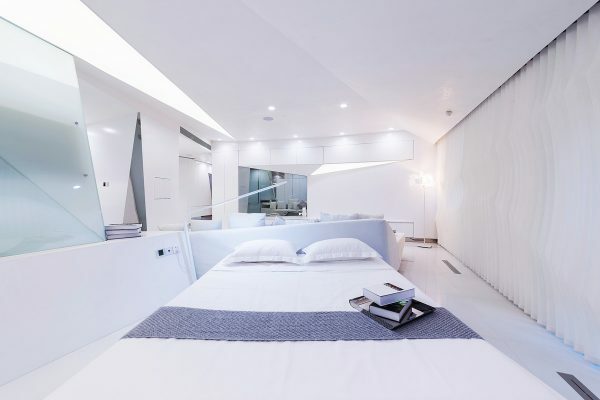 The bed itself is a cosy loosely upholstered design in contrast to the rest of the smooth minimalist room decor. A bright yellow powder-coated metal shelving unit displays a few special items. A bespoke window seat has been created as part of the window frame, extending out from the wall like a shelf. 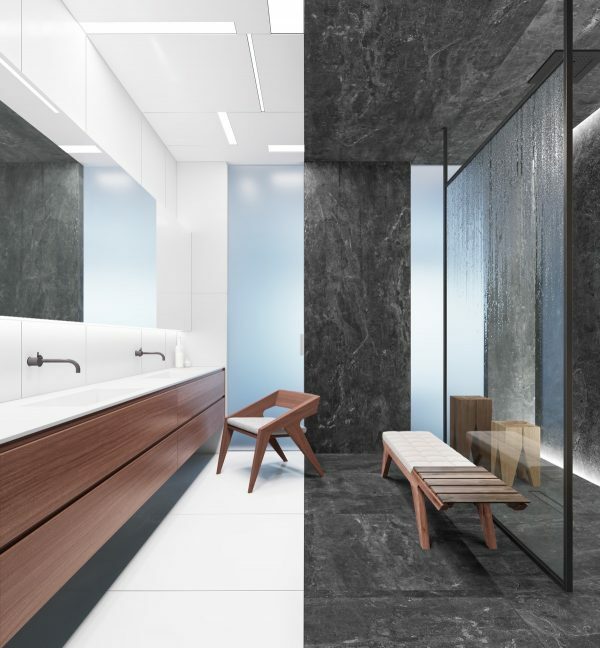 The bathroom is a charcoal grey and white affair with warm wooden accent furniture. The double sink bathroom vanity has one continuous surface that dips away for the basins. 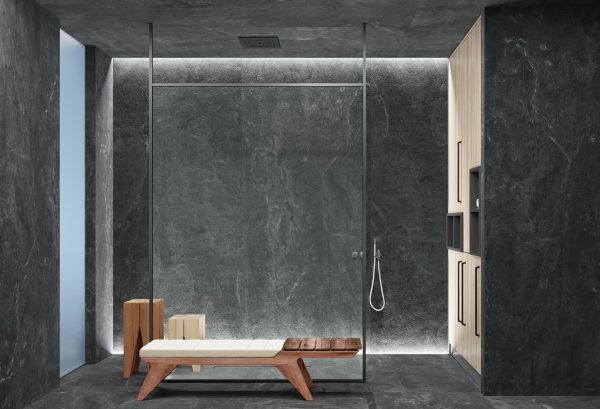 A walk in shower spans the length of the bathroom.